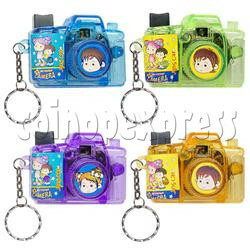 This series of Cartoon camera light-up key chains has rotating salver with 16 pieces photos. Red light is flash when pressing the shutter. The keyholder body is made of plastic. A red light set in front of panel. Light provided by two 3V LR-1130 button cells. It is really fancy using this camera to imitate photo taking. Emit a beam of red light. Two 3V LR1130 button cells. Minimum order quantity: 1200 pieces (can be mixed with different colour as shown on screen shot). 12pcs packed in a white plastic box. 1200pcs of keyrings put into an outer carton, carton size: W360 x D440 x H295 mm.